Click here... to view this email in your browser. Paddy Pallin 6hr Rogaine - Sun 19 June 2016. 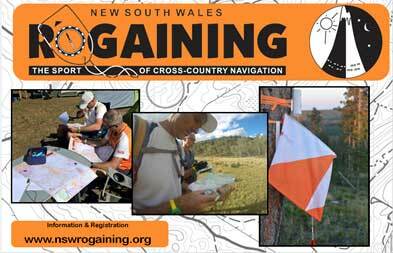 The next event is just around the corner, Peter Charlton, Bob Gilbert and Bert Van Netten have been working hard to provide another great course in the Catherine Hill Bay region, south of Newcastle. The area features magnificent coastal scenery, historical sites, rainforest and palm covered valleys, miners’ cottages and a pub. The terrain is varied with areas of open woodland, beaches and rock platforms, coastal wetlands and headland lookouts; each with their navigational challenges. The course will suit all levels of rogainers. You can stroll along the beach into town, partake in refreshments in the pub and stroll home for a meal provided by 1st Waitara Scouts. Alternatively, the runners and fast walkers can undertake the challenges of the extremities of the course. Each year on the first weekend of July the Bushwalkers’ Rescue Squad hosts a 29 ½ (!) hour rogaine (with an 8¾ hour option). Although it is aimed at being a training event for emergency services groups, there is a special “rogainers” category. Plus Vivien our event administrator is organising this one! If you are looking for more opportunities to sharpen your navigation skills, NavShield is a perfect opportunity to do so. 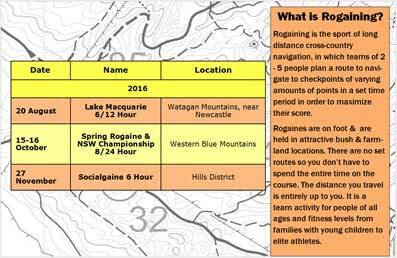 With the course generally set in a dense, mountainous region and the controls placed in subtler locations than in a typical NSWRA event, it will test your navigation skills like few other events would. A final chance to prepare for the imminent World Champs! Tell your friends about Rogaining! In a pursuit to gain a higher profile for a sport that few people have heard about, competitors will each be given a few flyers the Paddy Pallin event that they will be able to give to their friends to get them along to subsequent events! Depending on the effectiveness of this, there may be more measures of the like to promote the sport in future months. Thanks to Rochelle Duerden for brilliant design! Come and discover the hidden treasures of Canberra's northernmost town in the 2016 Metrogaine. Get lost in the street mazes of Ngunnawal and Amaroo, admire the views from Harcourt Hill and Percival Hill, lose valuable course time in the state-of-the-art playgrounds in Casey and Franklin (it is school holidays after all), ponder awhile about the hardships of 19th century life on 'Gungaderra' or 'Horse Park', or just go for points and venture into the sweeping grasslands of unimpeded travel. Congratulations to all who created the successful 12/6 hour rogaine in Tarlo River National Park on 21 May. Check out our website here for results and reports. Nearly 350 attendees for a bush rogaine was very pleasing, enabling a small event surplus which we chose to donate to the local community. That means $3.40 of your entry fee turned into two useful donations of $600 to the Tarlo River and Middle Arm Fire Brigades. It's important to support the people who manage and care for our environment and to also build goodwill for the sport of Rogaining. Course Setting Workshop to Follow World Champs! On Monday 25 July and Tuesday 26 July 2016 a 2-day course setting workshop will be held at the event centre of WRC2016 – Ross River Resort, near Alice Springs. Experienced coaches will lead the discussion in course setting techniques and philosophy. There will be a mix of theory and field practical sessions to discuss rogaine course setting/vetting processes and approaches. To be delivered through a combination of larger group presentation/discussion and smaller groups for hands-on practical sessions. An interactive and collaborative approach is planned, similar to the workshop held at the WRC in Finland last year. Our sport depends on people contributing time and energy to the organisation of our events. See the volunteers calendar and if you’d like to put your hand up, or know more about roles please get in touch with Dale or contact the event organiser. Not ready for a major role? How about helping out as an assistant to the registration team or event organiser? There are also other odd jobs that require assistants during the year such as equipment maintenance, trailer towing, administrative tasks (such as searching for a better insurance deal), etc. 2. You entered an NSWRA rogaine and elected to receive news as part of your entry form. You can unsubscribe yourself here.... When you enter another NSWRA rogaine you will have the option of declining any future emails.